Put cashews in a container and pour water over them until completely submerged. If you’re using a date to sweeten the milk, add it in with the cashews now. Let stand for at least an hour to soften. Drain the water. Add the softened cashews and 2 cups water to a high-powered blender. Add a pinch of salt. Blend on high for about 2 minutes. Pour the cashew milk through a nut milk bag or a fine mesh sieve lined with cheesecloth. Gently squeeze the nut milk bag or cheesecloth to speed the process along. If the milk coming out looks goopy, stop squeezing. 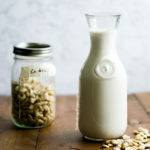 Store cashew milk in an airtight container in the fridge for up to 4-5 days.